Many people do a great job installing outdoor lighting for their own homes or businesses. Many folks truly enjoy spending time researching their options before tackling the actual installation. Other people prefer to leave the job to professional designers and installers. Neither option is right or wrong. You will know if you prefer to work on your own lighting project or offer it to professionals. For those who are considering working with a professional company that designs and installs outdoor lighting, there are many good reasons why you should do so. We can create the most beautiful, detailed lighting design. To do so, we need to listen to your needs. If you really enjoy entertaining outdoors, we know to design soft lighting that encourages conversation and congregation. If you are concerned about dark areas of your property, we learn what those areas are and we illuminate those areas. Lighting steps and stairs is necessary yet we understand the need for those lights to be as attractive and unobtrusive as possible, while still serving their purpose. We know when lighting should be for aesthetic purposes and when it should increase safety and security. Every single home is different, so your lighting design should be as unique, as well. We take your worry away regarding what fixtures to use and where to place them. This is what we do. Every day. We have learned which fixtures work best for which specific purposes. We know how to highlight the most beautiful, architectural features of your home or business and we know how to brighten the dark areas around your structure to make your property more safe and secure. Our designers combine their expertise with your vision to transform your home, business, or property into living spaces you will love. Our installation crews are fully trained and experienced in the installation of outdoor lighting. They know the daily ins and outs of wiring, fixtures, transformers, and timers. You can rest assured that your outdoor lighting system will be properly and safely installed. Using quality outdoor lighting components in your lighting project means less worry for you. We choose premier quality fixtures, many with lifetime warranties. This means less work and less worry for you. Would you like a lighting system that is completely worry-free? Our Annual Maintenance Program offers you just that. We design, install, and maintain your lighting system so that all you need to do is sit back and enjoy it. Dusk to Dawn Outdoor Lighting is a local, family-owned St. Louis business serving the greater St. Louis region and beyond. Our goal is to provide you with the best commercial and residential outdoor lighting. We can make your lighting wishes a reality; please call us or click here for your complimentary consultation today. It’s true that outdoor lighting is a phenomenal security measure for home owners, but it’s also a great way to highlight aspects of your home after the sun sets! 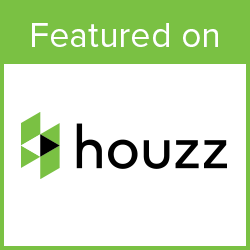 You may be looking around your property wondering – what exactly is worth highlighting here? You’d be surprised at how many options you have! Selecting specific landscape features or areas of your home and property can truly bring your already-gorgeous home to a new level. It can also increase your home’s overall value, and the enjoyment you’ll get out of your home as the days get continually shorter. You may have worked tirelessly to create a garden that transitions from spring to summer to fall. Why not showcase it in the evenings as well as during the day? Subtle lighting that highlights specific plants or arrangements can place a positive emphasis on your hard work. While some opt for motion-sensing floodlights around their garage area, you also have the option for a tasteful lighting system to keep this access-point bright and safe. Up-lighting placed near the garage can highlight the space. You can affix lighting fixtures to your home. You can also opt for pole-type lamps that keep areas well-lit. At Dusk to Dawn Outdoor Lighting, we love a good sitting-area lighting project. Just because the days are getting shorter doesn’t mean you don’t want to enjoy your porch, deck, or patio! From stunning bistro-style lighting along your deck to softly-glowing, smaller lights affixed to the beams of your front porch – you have so many options available. The best part? You get to truly be creative with your outdoor lighting team to create a year-round space that you’ll love and enjoy. If you have stunning trees all around your property, you can highlight them with beautiful up-lighting. This adds an extra layer of security to your home by lighting more of your property. It also creates a warm glow effect throughout the night. Of course, you also have the option to switch out for more festive lighting throughout the holiday season (or spooky lighting for Halloween!). While this may be more practical than some of the more romantic forms of outdoor lighting, having a well-lit address can save you quite a bit of headache. Whether you’re hoping the pizza delivery will find your home quickly or you have friends and family visiting, having your house number clearly lit will help to guide them in and avoid any confusion. We have discussed pathway lighting numerous times on our blog and that’s because it is critically important. Pathway lighting is a key safety precaution. Having well-lit paths and walkways can prevent you from injuring yourself, your family, and your guests, plus well-lit areas promote the security of your home. You can choose to have subtle lights embedded in your xeriscaping, in-ground lights along the edge of walkways, or simple and small lantern-like lights that stick into the ground near your paths. The latter is often the most popular, likely because you can choose lighting that exactly matches your personal taste and landscape style. A pool or spa can take on another look entirely with appropriate lighting. Lighting around the edge of your pool or spa area is only the beginning of the creative lighting styles you can take advantage of. We’ve seen a lot of success with colorful lighting cast onto the water, it has a very beautiful effect! Not a fan of obvious landscape lighting lanterns or fixtures? Installing small up-lighting systems at key points underneath shrubbery or bushes in your yard might be the solution you’re looking for! 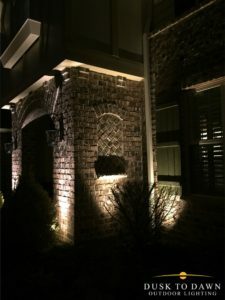 This provides subtle landscape lighting, keeps your property well-lit and secure, all without the stress of having to pick a more visible lighting fixture to match the rest of your outdoor décor. Creating an outdoor landscape lighting design is an exciting process. The design you and your landscape lighting design team put together can be as creative or simple as you want it to be. The fact that your outdoor lighting is so unique to you, your home, and your design tastes makes it more enjoyable (unlike so many painfully frustrating home improvement projects). The areas we’ve listed here as examples of where to use outdoor lighting only scratch the surface! Your home’s features will provide infinitely more choices to pick from. So, what are you waiting for? Start the outdoor lighting process today by contacting Dusk to Dawn Outdoor Lighting for a complimentary consultation. 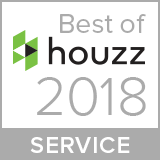 We’re so excited that you found us, and that you’re ready to take this next step to improving your home’s security, value, and your own ability to enjoy it’s many beautiful landscape features! When people think of landscape lighting they often think about their personal home. Maybe they have garden features or pathways that they would like to be lit to increase the curb appeal and overall value of their home. Maybe they have security concerns or live in a rural area with wild animals, in which case they’d be looking at motion sensors or floodlights. But what few people think about is the landscape lighting required by commercial businesses. 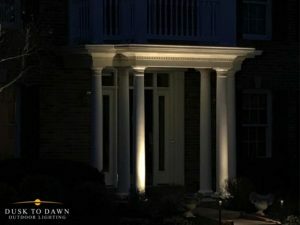 Dusk to Dawn Outdoor Lighting specializes in a wide variety of outdoor lighting – from security plans, to personalized landscape lighting for your home, to unique exterior commercial lighting for St. Louis’s local businesses and housing developments. What businesses or developments would require a landscape lighting plan? Suburban neighborhoods, Condo Developments, and Apartment Complexes. Neighborhood lighting is incredibly unique because it requires both security, like the lighting of walkways, and aesthetic lighting, like the lighting of garden features. Retirement and senior living communities. Security plays an especially valuable role here. It’s necessary to keep outdoor areas lit for the safety of employees and residents alike. Open-air shopping areas, and boutiques. Shops are often open into the evening and you want your customers to have an enjoyable and safe experience at your commercial location. Landscape lighting can offer these advantages. Restaurants and their patios. You need a lighting plan that captures the spirit of your restaurant, highlights your location’s visibility to potential patrons in the evening, and softly but effectively lights your patio. Safety and security lighting for warehouses, storage facilities, etc. Keeping your property well-lit can keep employees safe and deter criminal activity. What kinds of lighting do these businesses benefit from? As we mentioned before, there is no one-size-fits-all lighting solution. We love working with local, commercial businesses on their outdoor lighting projects because we can tailor a solution exactly to their needs. Of course, some businesses that are more customer-facing, like restaurants or shopping areas, tend to have more of an aesthetic focus. Other commercial properties such as residential areas – neighborhoods, condos, and apartment complexes – require a variety of lighting types. These properties need both security and aesthetics to please and protect their residents. Still other commercial properties like warehouses and storage units need broad-stroke lighting to keep their area secure and to provide an extra layer of safety. What types of lighting does Dusk to Dawn Outdoor Lighting use? At Dusk to Dawn Outdoor Lighting, we use low-voltage LED lighting because it is aesthetically pleasing and its glow is stunning. We also use it because it is long-lasting, which is perfect for commercial properties that don’t want to constantly be replacing lights or adjusting their lighting design plan. LED lighting is also known for its energy efficiency, which is important for any business to keep in mind to keep their electric bills low and stay environmentally friendly. Finally, LED lighting fixtures emit a low amount of heat and are strong enough to perform even in extreme temperatures – be it the blazing heat of summer or the icy cold of winter. If your business needs both a stunning light display and security lighting, no worries! Our lighting designers at Dusk to Dawn Outdoor Lighting can help you create a custom plan that addresses all your needs. We offer our customers an initial consultation and walk-through tour, where we come to your property and very literally walk through with you, by your side. We listen to your ideas and make recommendations, getting a deeper understanding of your lighting needs so we can create a plan that’s perfect for you. We will work with you to incorporate an aesthetic that matches your business and also provides ample security lighting to keep your patrons, employees, and everyone else near your property safe from dusk to dawn. Most business owners we know are busy. In fact, some of them aren’t even physically at the property they manage at all times, and we don’t expect them to be. We can help you set up timed lighting, or motion-sensing lighting that essentially automates your outdoor lighting. You can adjust the timer as needed as seasons change or leave it alone and forget about it. You won’t need to worry about whether you need assistance over time with your lighting. Dusk to Dawn Outdoor Lighting offers a worry-free Annual Maintenance Program that ensures your commercial lighting will always be taken care of. Your schedule is full enough; you don’t need perpetual outdoor lighting maintenance weighing on your mind, too. Even though the LED lighting systems we use at Dusk to Dawn are low maintenance and long lasting, we understand that things happen. Lawn and landscape maintenance companies can dislodge a system, burrowing animals can do damage, and weather can take a toll on wiring. We perform fixture, transformer, cable, and electrical maintenance annually, and we also honor all warranties on our systems. Of course, we also replace warrantied lights that burn out, free of charge. You may not be in your yard as much as summer comes to an end, but that doesn’t mean outdoor lighting can’t maximize your home’s value and make certain areas of your yard more usable. During summer, being outside is ideal and you may have focused a significant portion of your attention on amplifying your backyard paradise. Now that your kids are back in school and the temperature is slowly but surely falling in the evening hours, it’s only natural that you won’t be spending entire weekends in your backyard or on your patio. Fall, however, is the perfect time to rework your outdoor lighting to focus on the areas of your yard that you’re getting the most out of. It’s also a good season to make sure all of your outdoor lighting needs are squared away before leaves start falling and then (dare we say it?) snow! As leaves fall and stunning garden arrangements start to disappear in the coming months, you should consider adjusting your lighting. Dimming lights on bare branches can help to make them less severe. Additionally, you should consider switching to LED bulbs, Dusk to Dawn Outdoor Lighting’s preferred lighting option. That’s because LEDs run cooler than older outdoor lighting bulbs, which are often halogen. As leaves fall, a hot bulb can become a dangerous fire hazard as well as harmfully heat plants during the day. LEDs help eliminate that potential problem! You can also refocus your outdoor lighting on newly appearing fixtures in your yard. Flower gardens may no longer be a point of interest, but you can highlight the stunning color of autumn leaves instead. Remind yourself what you love about your home during this changing season with the right lighting strategy. Although temperatures are cooling, you can still enjoy your evening hours outside! Using outdoor lighting to focus on the parts of your yard you use in the fall can help inspire you to get outside a little longer before winter. For example, if you’re more likely to use your fire pit in the cooler fall months for s’mores and family bonfires, consider lighting that makes the ground around that area more accessible, preventing trip-hazards. You can also choose to light a pathway to that area for extended use. Another example we love is making your deck or patio someplace you can enjoy well into the fall with stunning lighting plans. A simple back porch light may have worked when the days were long, but now that it’s getting darker sooner, you need more lighting to enjoy evening dinners or get-togethers with friends on the deck. Consider installing lighting along the handrails or steps of your deck, or beautiful string lights to create a bistro effect. You’ll want to spend all fall outside in the evening, even if it means having to throw on a light jacket! Do I have any burned-out bulbs? Are any of the lighting wires above-ground where they could be damaged by weather or animals? Does any of my outdoor lighting need to be adjusted because we’ve changed our landscape? For example, if the swing set is brand new, you may want to consider installing additional lighting. If you have removed a bird fountain that was once lit, you may want to adjust your lighting design. If you have timed outdoor lighting to light your yard from dusk to dawn, you’ll likely need to reset your timer periodically during this season. Dusk comes sooner and dawn comes later and you want to make sure you’re fully lighting your yard during those times for home security purposes. Adjusting your timers with some regularity through the beginning of winter will help assure you’re getting the most out of your outdoor lighting. Winter holidays shouldn’t be the only holidays where we get to have fun with lighting. We offer options for changing to colored lights during fall holidays, too! For example, creating a “spooky” effect for Halloween is something to consider. You can do this in several different ways, whether it’s just choosing a colorful light to highlight tree branches or creating a “haunted pathway” effect to your front door for trick-or-treaters with blinking or colorful outdoor lighting. Fall is such a beautiful season. Problems with mosquitoes and other bugs tend to die down, leaves change, the weather cools off, and its generally beautiful outdoors. There’s no reason to let the shorter days limit the time you get outside and enjoy your yard! Outdoor lighting can help you get the most out of this wonderful season. Happy fall! Landscape lighting is an excellent way to add value to your home, increase the visual appeal of your yard, and promote safety around your property. But did you know that you can use landscape lighting to improve the lives of your kids, too? It’s true. Although we don’t always think of them as partners in our homeowning journey, our kids have a huge emotional investment in our homes and our landscapes. And, of course, you want them to grow up somewhere where they feel safe, can enjoy themselves, and are proud of. These landscape lighting ideas can help you achieve all of that – and will put a smile on your kids’ faces. Who was afraid of the dark when they were younger? A study has shown that over 73% of children between the ages of 4-12 years old are afraid of the dark. That’s a huge percentage! Although most people grow out of this fear, it isn’t entirely irrational – we want things to be illuminated so we can see what we’re doing, where we are, and what’s going on around us. Your kids are no different. During the busy summer months when they’re spending much more time outdoors – both during the day and at night – it’s important to light high-traffic areas like your back deck, front porch, basketball hoop in the driveway, etc. This will help your children feel safe and be able to maneuver around your home at night without feeling unsafe or anxious. By illuminating walkways you’re preventing safety hazards both big and small. How many times have your kids tripped and hurt their knee? Or fallen and extended an arm to catch themselves only to wind up with a cast for the rest of the busy summer season? Take some of the guesswork out of what they’ll bump into while running around with their friends outside and create a landscape lighting plan that includes illuminating your walkways – both in front of the house and around your backyard. This is especially important if there are any unstable surfaces there – like beautiful (but admittedly uneven) pathway paver stones, or slippery gravel. This is a safety precaution you should consider taking whether or not you have children. Having unlit outbuildings or dark areas of your home leave it more vulnerable. Install motion-sensing flood lights or set spot lights up on a timer to turn on from dusk till dawn to keep these lesser-used areas well-lit and completely visible. This drastically increases the safety of your home for your family and will help put your mind at ease when your kids are playing outside at dusk where you may have not been able to see them in dimly lit parts of your yard before. Anything that keeps them safe and puts your mind at ease is well worth it. Where do your kids enjoy spending time outside? Do they love to shoot hoops with the neighbors in your driveway? Do they have a swing set around back that they lose hours to each day? Think about where they love to be and use landscape lighting to make that space uniquely theirs. You can install lights above the driveway that let them extend their sports-time. You can install aesthetically pleasing timed lights around their playset to make climbing up and down the ladders safer or to make it easier for you to see them as they enjoy their swings. They’ll appreciate having a well-lit space to play during the summer when there isn’t school to prepare for in the morning, and you’ll enjoy watching them get the most out of their outdoor space during the time they can use it. Do you have a beautiful deck, fire pit, or other entertainment-focused yard fixture? Create a landscape lighting plan to extend the hours you can use your home’s best fixtures to spend time outside with family this summer. Added bonus – if you spend time roasting marshmallows over a fire pit or playing a board game on the deck in the evening, the temperatures will be cooler. Outdoor time as a family without melting in the hot summer weather? It’s a win-win! Your kids have just as much investment in your home as you do, though their motives may be different. While you want a stunning light fixture to highlight your beautiful, time-consuming gardens, they want to play on the slide for a few extra hours! Landscape lighting doesn’t have to address one concern or the other, it can be a solution to both and create spaces that your whole family can enjoy. Interested in some help or in hearing a few unique ideas? Contact us today, we’d love to help create a unique lighting plan for your family!